25 ACP rounds are extremely popular today due to their concealability and minimal recoil. 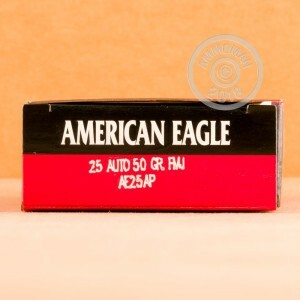 Federal brings you a high quality, reliable round featuring a full metal jacket bullet with this American Eagle ammo. Each projectile is a 50 grain projectile and perfect for sending down range during your practice sessions. 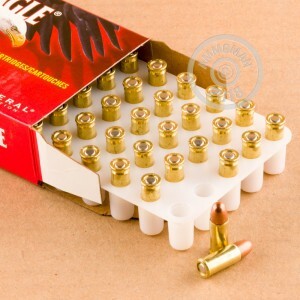 These rounds are non-corrosive, reloadable, boxer primed and brass cased. 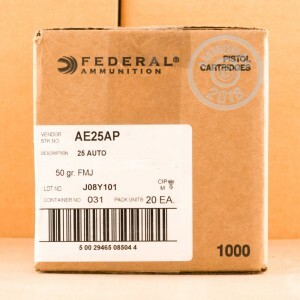 Federal is one of the most well-known and respected names in the ammo world. You can count on a high quality product with any Federal purchase. Don't forget about AmmoMan's free shipping on any order over $99!